The Wide World of Secondhand Clothing - Planet Aid, Inc.
People often wonder what happens to the clothing they donate to charities in the United States. Many mistakenly believe that their donations are helping to clothe the needy in nearby communities. It is true that some quantity of donated items may be freely distributed to help people domestically, but that quantity represents a tiny fraction of the nearly 2 million tons of items that are dropped off to charities annually. There is simply way too much unwanted clothing and not enough domestic need in the United States. So where does that huge quantity of donated textiles go? According to the Council for Textile Recycling, approximately 10-20 percent of the 2 million tons of textiles donated in the United States end up on the racks of domestic thrift stores. What about the rest? Nearly half of what is not sold domestically (or about 1.6 million tons) is sold on the international secondhand clothing market, and the vast majority of that quantity is resold in secondhand markets in developing nations. 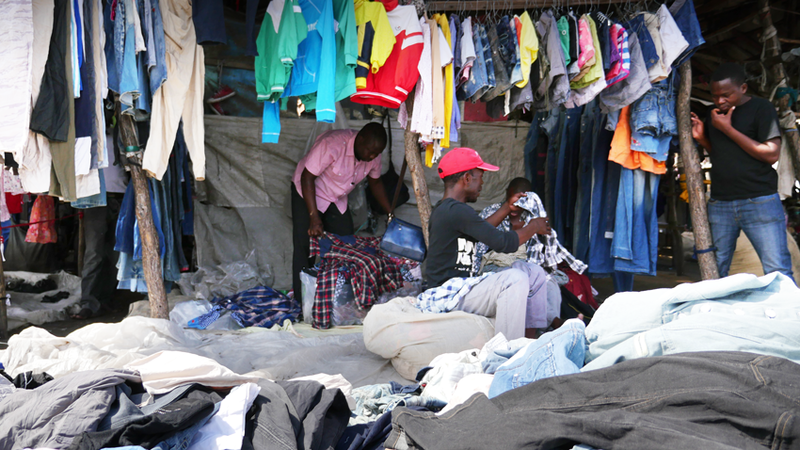 Vendors at an outdoor secondhand clothing market in Beira, Mozambique. These markets are robust centers of economic activity, and people rely on them not only as a source of clothing but as a source of income and employment. For example, a study conducted by the Nordic Council of Ministers found that secondhand textiles exported from Nordic countries provided a living for an estimated 10,000 market traders and their families in Africa. Each country has its own special affection and corresponding name for secondhand clothing. For example, in East Africa secondhand clothing is called by the Swahili name mitumba, in Zambia it is salaula, in Ghana it’s broni wa wo, in Rwanda it’s chagua, and in Central America it is ropa americana. The passion for secondhand clothing is abundantly evident in markets, with shoppers busily searching for the best brands and the best bargains and vendors loudly competing to attract their attention. Pepe is the name Haitians use for secondhand clothing. It dominates both the style and the economy of the island nation. Tate Watkins, a reporter for Medium, and a former critic of the secondhand clothing industry, visited Haiti to explore the pepe markets. 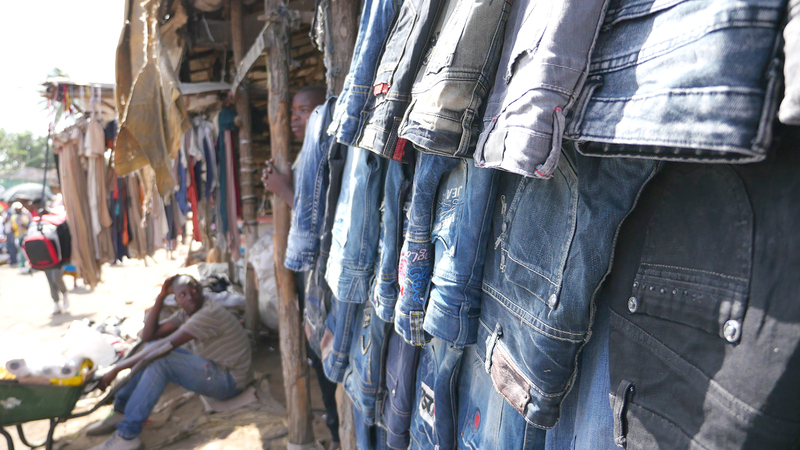 According to Watkins, Haitians embrace secondhand clothing and are extremely eager to purchase higher-quality brand names from local sellers at affordable prices. To know more about the Haitian markets, see Secondhand Pepe, a documentary by Hanna Rose Shell and Venessa Bertozzi. 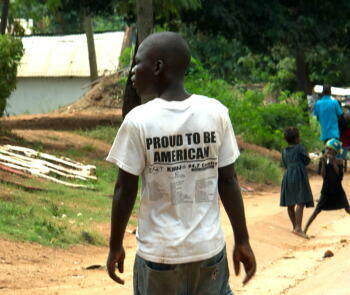 The film takes a close look at the history and current culture of secondhand clothing in Haiti. In Ghana, secondhand markets have existed for more than 30 years. For example, Accra’s Kantamanto Market has long been an integral part of the city's economic productivity and vibrancy. Accra’s Kantamanto Market has contributed and linked in to the urban center’s economic productivity and vibrancy. Shoes are a popular commodity and are mostly imported from the United States, London, Italy, Holland, France, and Korea. In the Republic of the Congo, there is a well-known group of men, the sapeurs, whose pleasure in displaying fine fashion has become famous. Their wardrobes include flamboyant pieces, with polished tailoring and impeccable attention to detail. A few years ago, these men were celebrated on a Guinness beer commercial, which showcased their remarkable sense of fashion, individual poise, and unsinkable spirit. In a region where violence is prevalent and there is a never-ending dependence on humanitarian aid for basic needs, dressing well has become a way to transcend difficult circumstances and embrace life. In a guest piece for the New York Times, writer Zahara Bolouri described the excitement and activity that surrounds the arrival of used clothing in far off Mozambique. His essay "Happiness is a Bundle of Used Clothes" paints a vivid picture of how villagers respond to a shipment of clothing, where anything from Louis Vuitton bags to colorful T-shirts are snapped up by shoppers. While secondhand clothing is extremely popular in East Africa, the East African Community (EAC)—an intergovernmental organization that includes Burundi, Kenya, Rwanda, South Sudan, Tanzania, and Uganda—proposed systematically phasing out the importation of secondhand clothes by 2019. The ban was aimed at protecting local textile manufacturing, which has been declining over the years. All but Rwanda have since decided to reconsider the collective ban. However, the question remains as to whether the Rwandan prohibition can actually bring about its intended aim, namely, to bolster a struggling textile sector at the expense of the popular and robust secondhand market. So far the policy appears to have only succeeded in encouraging an influx of Chinese factories. Critics believe that banning secondhand clothing in the EAC will not boost local industry and that factories such as C&H won’t alter the popularity of secondhand clothing, whose trade has been integral to the local economy for decades and has become a cultural phenomenon in its own right. In response to the Rwandan ban, the U.S. has moved to suspend Rwanda's duty free access to U.S. markets. One of the eligibility criteria for allowing duty-free access under AGOA is that a country must progressively eliminate barriers to American goods. Rwanda's ban represents a violation of this policy. Secondhand clothing markets are helping to save textile resources by reusing clothing that has plenty of remaining value. They are thus helping reduce environmental harms associated with clothing manufacture and disposal, which is an issue of increasing concern. As pointed out by the ClimateWorks Foundation, if apparel consumption trends continue as they have, climate change impacts from this industry are expected to double by 2030. This means that in 12 years the apparel industry will emit a startling 4.9 metric gigatons of CO2! While secondhand markets cannot completely mitigate damaging trends in the fashion industry, they can make a significant contribution to reducing C02 while also providing employment for those in developing nations. Help support these secondhand markets by donating your clothing today. 1 Elsewhere, Chinese investments in Africa are pushing local producers out of business. For example, Nigerians protested against Chinese manufacturers who began making traditional fabrics at new factories and then selling them at cheaper prices, which undermines the indigenous industry.